We’ve been getting some flak these days from our 10.958 year old about our lack of car. She’s entering those tween years: asserting her independence and trying to blend in with everyone else. And this whole bike thing sometimes cramps her style. Not sure if you’ve noticed, but you kind of stick out when your family rides bikes instead of riding in cars. Imagine my surprise this past weekend when the 10.958 year old suggested we head out on bikes for a mother/daughter day at the park. She could easily have chosen a walk down to University Village for some shopping: which I would have predicted had I been forced to place a bet. Instead we pedaled over to Greenlake, ate some frozen yogurt, kicked around the soccer ball and practiced our Lacrosse skills. We both enjoyed the outing and promised to do it again soon. Tim and I find ourselves discussing kid/bike rebellion quite a bit these days. We don’t have any answers yet other than continuing to ride and be rest assured that our kids will appreciate our bike lifestyle some day. Our goal is to end up with a couple of kids who are self-sufficient, independent, able to get places using their own power and who are proud that they are just a little bit different from the status quo. Oh, and we also hope they don’t completely hate us. Anyone else experiencing tween or teen bike rebellion? I seem to remember someone mentioning that their teenage daughter is going through something similar. We’d love to hear from you! This entry was posted in bigger than here, bikes, dates, extravehicular activities, family cycling, kids and tagged bikes, mothers and daughters, tweens. Bookmark the permalink. We are getting there. Our nearly 10 yr old girl is our complainer. She doesn’t understand and gets tense about biking, yet surprises us every time when given options. She said this morning at breakfast that when she graduates high school she thinks that would be a good time for a cross country bike trip. Like all good growth, she has her good days and her trying times. We are doing what you are doing and waiting it out and keeping our sights on the benefits. Is 10.958 old enough for riding alone? Perhaps stressing the freedom aspect of cycling might change things. I imagine that it sure would be scary for a parent though. Hi Brad – it may indeed be old enough. She already has quite a bit of freedom when it comes to getting to/from school. I think the underlying problem is that none of her friends/friends’ families ride. If she had riding buddies, the freedom aspect would be a real draw. But right now there’s no advantage in freedom when everyone else is being driven everywhere — we may think she has freedom and mobility, but in her eyes she just stands out as being different (which is bad, bad, bad!). 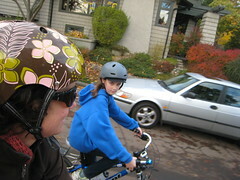 We’re lucky that a few of our daughter’s friends ride to school (if only occasionally), and so do some of her teachers. Yes! friends who ride are key. (And it just takes one)! My friend’s daughter rides with 2 or 3 other girls on a regular basis all over the neighborhood. I love seeing them around town on their bikes…gives me hope that things could change for my kids. Oh nos! Yeah it is hard being different. And it really is too bad that there aren’t a lot of peers who are out riding. I think that is the biggest factor. I know for the group of 10 yr olds on my block ( four of them plus an 8 yr old younger bro and a 14 year old older bro) being able to be a pack of kids on bikes, scooters and feet makes all the difference. they DO see that they have increased independence than their peers I would be. ( in this case the biking was more kid led. the kids wanted to bike and I see the parents out on bikes more with the kids and also on solo errands. It’s awesome to see.) I wish your 10.958 yr old had some bikey friends! We haven’t experienced it yet, but the reverse … My three oldest– including the 10 year-old– complain that they “hate cars”. It’s fine, I guess, within our family, but when my parents take her somewhere (in a car), the “hate cars” rant is pretty rude. We’ll see how things change over the years. I think the kids like bikes so much exactly because riding everywhere is different from the norm… Kids want to be the same as everyone else, but they also want to be different too (in a cool way). I guess the trick is somehow making sure biking is always different in a “cool” way??? Hey, while your kids may appreciate the cycling lifestyle, they may end up making different decisions for themselves once they grow up. Just wanted to mention that “appreciation” is as far as you should expect. If they end up working as rural vets, biking just isn’t going to suit. As always, I am taking mental notes as I read your parenting-biking posts. You are ahead of us age-wise and so far, my fellas have not *yet* given us a hard time about biking. They still are pretty jazzed by it, but to be fair, we do still own a car which I know you don’t. We have not yet heard a peer comparison about why it is uncool/cool but my older fellas are not totally saavy social beings. They now take a school bus so their daily biking has decreased and they are really into the school bus. Ultimately, I believe we are teaching our kiddos that biking is a valid form of transportation. That does not necessarily mean they will be car-free adults or lovers-of-all-things-bikey. They very well may make “different decisions for themselves once they grow up,” just as Peter and I have from our parents. However, perhaps our kids may growing up believing that it is not necessarily a necessity to own a car OR that a car is the only way to get from one place to another. That, in itself, is an incredibly worthwhile lesson for them to learn….